In fact, I forwarded a link to the Indiegogo pi-topCEED campaign to my wife and suggested, "This would make a great Christmas present!" Unlike other RPi projects and kits, the pi-topCEED billed itself as a fully integrated, plug-and-play learning platform, complete with an RPi2 (later upgraded to an RPi3), a 13.3" HD LCD screen (later upgraded to 14"), and a breadboard kit for attaching and experimenting with external devices. As with many of the other Kickstarter-like products I've ordered (or had ordered for me), I forgot about the pi-top until well into the new year. Delivery dates began to slip, and the folks at pi-top had trouble with their Chinese fulfillment house, but nonetheless, the pi-topCEED was a go and finally landed on my doorstep in late August, ironically while I was away at LinuxCon. As promised, the RPi desktop came with everything in the box you need to start experimenting with Linux, electronics prototyping and the RPi—except a keyboard and mouse. You have to supply your own (unlike the pi-top laptop, which comes truly complete). 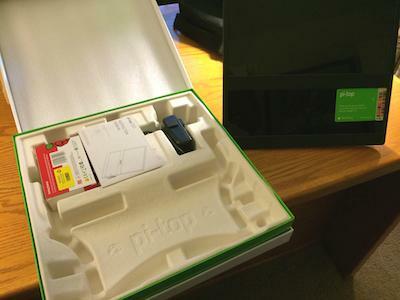 The pi-topCEED is about 15 inches square, with a 14-inch HD screen and adjustable stand. The little desktop comes with a power supply, easy-to-follow instructions, the breadboard and wire connectors, and an 8GB SD card preloaded with pi-topOS, a customized version of the stable and popular Raspbian. The case itself is made of sturdy plastic and sports a metal kickstand that lets you set the pi-topCEED on your desk at pretty much any angle. At the core of the device—directly below the screen—is a front-facing compartment with a removable smoked plexiglass cover. The compartment holds a custom pi-top PCB that provides power, HDMI, USB and a video header; and the pi-topPROTO, a HAT-compatible add-on board with its own GPIO header and about 200 breadboard-style ports for prototyping electronics. The latter mounts to a pair of rails using small magnets. The included RPi3 mounts to the same rails, with its four USB 2.0 ports and single 10/100 Ethernet port exposed on the right side of the desktop for easy access. The unit features a compartment below the screen that holds the RPi3, right, and the main pi-top PCB, left. Everything slides together neatly, the RPi connecting to the pi-top PCB via a short HDMI cable and a GPIO header cable. Slide in the SD card, and that's it. The little desktop is ready to boot. Of course, if you want to run regular Raspbian, Pidora or another OS for the ARM-based RPi, you can do that too, but part of the pi-topCEED's draw is its custom OS, which is designed for students—formal and otherwise. The combination is greater than the sum of its parts, and the little desktop has more than enough horsepower and features to make it a highly functional programming tool, maker's platform or low-power desktop. The RPi3 has 1GB of RAM and a 1.2GHz quad-core ARMv8 64-bit processor that make it much snappier than the older RPi2. The built-in Wi-Fi and Bluetooth are handy too and just work—no fuss. For those familiar with Raspbian, pi-topOS has some key differences, including a dashboard, which is a sort of overlay of tools and widgets that aim to make monitoring and using the pi-topCEED easier. The desktop and panel have a bit of an Xfce feel. If you create a new user and log in with that account, the desktop defaults to the standard Raspbian version. You also can try the pi-topOS without the pi-topCEED—it's a free download. Pre-installed in pi-topOS are several programming tools, including Python 2 and 3 (with IDLE); Scratch, the drag-and-drop scripting tool; BlueJ Java IDE and Greenfoot Java IDE; CEEDUniverse, a video-game learning tool; Wolfram and Wolfram Mathematica, a knowledge-based programming language; and SonicPi, a live coding music environment. Booting takes about 30 seconds, and I was able to launch the Python integrated development environments and start coding immediately, which was satisfying. The other tools are more involved, but documentation is provided via websites and onboard help files. As a true desktop, the pi-topCEED comes with the complete LibreOffice suite, Chromium and Epiphany web browsers, and Claws mail. All run cleanly and without hesitation. In fact, I wrote this on the pi-topCEED using LibreOffice Writer while running Chromium with four browser tabs open and a terminal SSH session to an external server. The RPi3's built-in wireless was as easy to configure as any wireless interface I've dealt with on any device, and its throughput is good. Some ad-heavy web pages are hard for the RPi3 to handle, but on the whole, browsing with Chromium was responsive. I had more difficulty with the wired network connection. I wasn't able to get a working IP address without manually editing /etc/network/interfaces. As a modular, easy-to-deploy RPi playground, the pi-topCEED certainly lives up to expectations, particularly as a tool for students (and their teachers) who want to learn about Linux and electronics. For example, this setup makes it easy to build physical projects driven by the RPi without the fuss or the mess of sprawled gadgets and wires. My version of the pi-topCEED, as an Indiegogo campaign, was $99, which included the RPi3. Today, the pi-topCEED is $150 with the RPi3 and $115 without. Those prices are inching near the price of some low-end Chromebooks, so if you're strictly looking for a low-cost Linux box, one of those might serve you better. However, if you're looking to fill a classroom or deploy a compact, modular environment in your den for experimenting, the pi-topCEED is a good option.